@kimstockwellphoto Takeover Day 2: Donâ€™t be afraid to get weird. ðŸ˜œ When I first started photographing weddings, I constantly battled with taking the shots I thought people *wanted* me to take, and finding time for the shots *I* wanted to take. Insider tipâ€”people will literally do anything as long as you are nice about it, and most importantly, ask with confidence. Confidence is key! For example, this is one of my brides and her twin sister. I knew I wanted an image of them that showed the close bond they have, so I asked them to hold hands. Then, despite the 100-degree Virginia summer day, I said lean in close to and touch foreheads. They didn't doubt me because I said it confidently, but y'all, that was crazy! Crazy, weird, whatever you want to call it, can be so worth it. Stay confident in your ideasâ€”itâ€™s the reason your clients hired you in the first place. @kimstockwellphoto Takeover Day 2: When photographing couples on their wedding day, I make it a point to direct them into their own images. ðŸ“· I never want a couple to look back at an image and go, â€œWhy did Kim tell us to do that? !â€� I like my clients to be comfortable with me to the point that I am not even really there. In order to get them to settle into the moment, I request a lot of actions, and from there, I let them interpret what those look like. For example, in this image, I asked the bride to lean into her new husbandâ€™s chest and hold onto him. Then I asked her to close her eyes and take a deep breath in through her nose and slowly let it out through her mouth. This is a very relaxing breath that instantly puts people at ease. By being at ease, she settled into the image even more, and you can just feel the immense peace and solidarity of this moment. 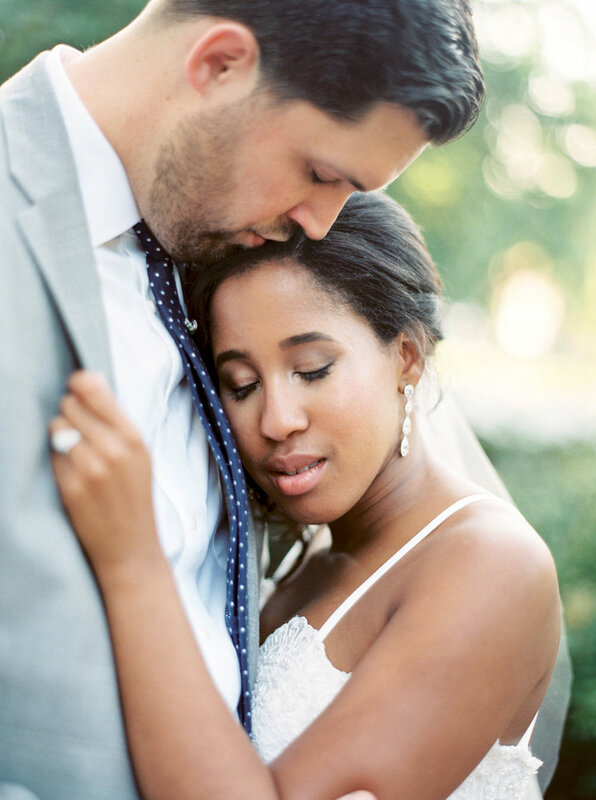 @kimstockwellphoto Takeover Day 2: Mentors have been so important to my development as a film wedding photographer. ðŸ’š I put off learning film for the longest time because the community felt different from digital. I had film photography on this pedestal and I was terrified of not being accepted. But my mentor @nikkisanterre took me in with open arms and taught me more than I could have imagined. She is now sharing that hospitality + education through the @hybridatelier with fellow educator @samoffit. And *TODAY* they are launching some incredible educational opportunities for new and seasoned film photographers. I highly encourage you to check them out! @kimstockwellphoto Takeover Day 2: My favorite way to manage large bridal parties is to break them up into smaller groups. ðŸ‘¯ After I take the shot of all the bridesmaids, I will ask if there are any groups within this group (family members, childhood friends, sorority sisters, etc.). From there, I will photograph each group within the group because it does two things: (1) Gives the bride a chance to have a moment with each of these little groups and (2) it helps me bring a unified and intimate feel to their overall wedding gallery. This image is of the bride with her family members in the bridal party.